Hello Katie Girl: No Fear of Color! It's no secret that I love color and use it liberally in my wardrobe. It's also no secret that I love colorful backdrops for my photos, but usually I try to find a balance between the two. 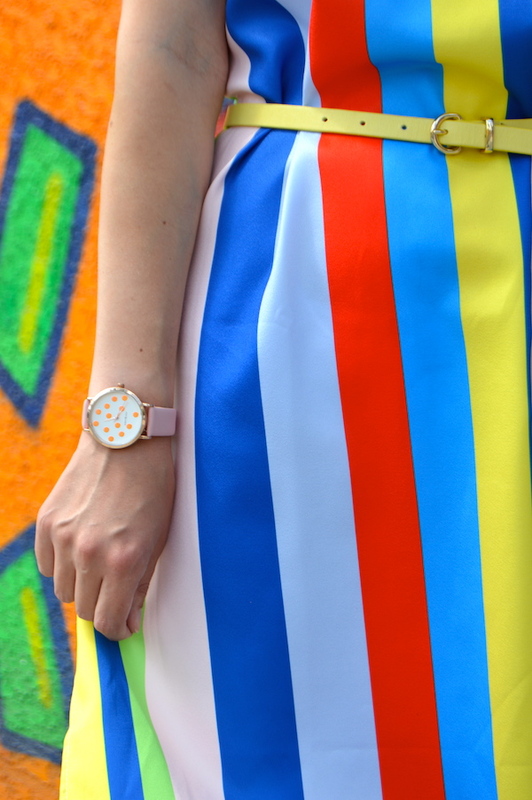 In this post, clearly both the outfit and the wall are saturated in color! 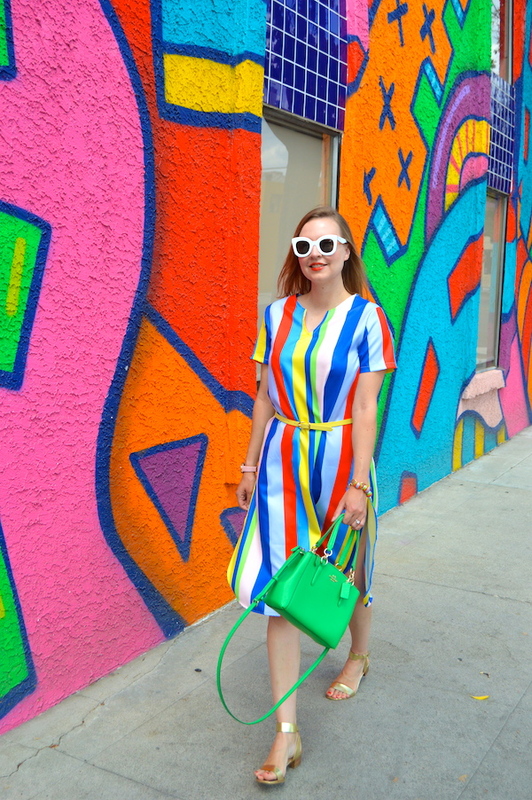 Originally, I had planned to wear this rainbow striped dress against a more neutral wall that didn't have quite so much going on, but unfortunately it was fenced off, which meant I needed a backup wall. I was hesitant to use the backup wall shown here, as it's really loud and very, very colorful, but I once I got the photos home, I was pleased with the overall effect. After all, if you're going to go for color, why not go all the way? 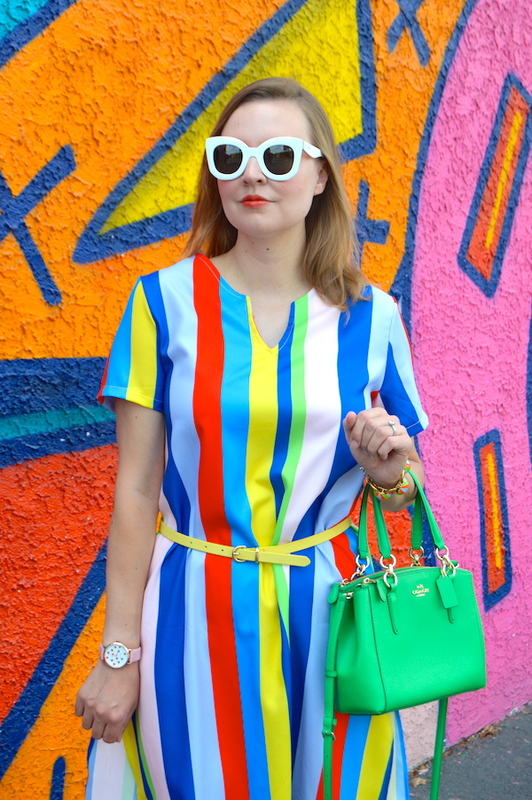 The rainbow color dress I have on is from SheIn. One of the things I love about their clothing is that it's inexpensive but, if styled correctly, can have a more high-end look. When I tried on this dress for the first time, I was a little unsure about it. (I also had a moment when I thought it closely resembled the uniforms for Hot Dog On a Stick!) My husband comforted me, however, saying that if I wore it with a belt and without the uniform hat I would look fine. Anyway, this dress, much like the photos, really grew on me, so it all worked out in the end. I guess you can say that you can never go wrong with color! I have a vintage piece that is very similar to this but it is made out of terrycloth and longer. I love that piece! "without the uniform hat it looks fine." lol. i love this in front of the wall. yeah, there's a lot going on with both wall and dress, but there's also a sort of camouflage effect, lol. This print is amazing, adore that dress on you. I'm loving these pretty rainbow stripes, doll! Always the perfect rainbow of color! You look gorgeous Katie! LOve all of the color Katie! Your dress is adorable! boy, i wish we had some more colorful walls here ;-) Love that you added metallic with your pretty sandals.